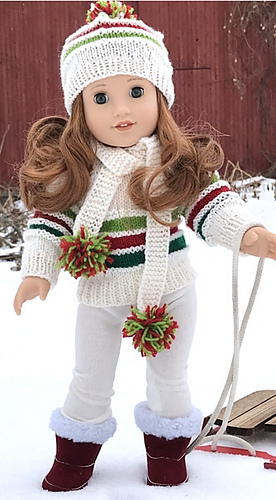 This is the perfect color-coordinated winter outfit for the active Doll! It consists of a Sweater, Hat and Scarf, featuring a motif of horizontal stripes. The choice of colors is up to you! Optional pom-poms add a fun little accent. Sweater is worked top-down, seamlessly, back and forth, with raglan sleeves and button band on the back. The sweater is worked in stockinette and reverse stockinette, with 1x1 rib at the neckline, hem and cuffs. Sleeves are worked in rounds on dpn. The hat is worked in-the-round, from the bottom up. The scarf is worked in rows in garter stitch.